Dr. Doni lists the best nutrients, herbs, and natural supplements that can help heal Leaky Gut, and explains what they do and who should take them. Over the past few blog posts we have been looking at everything to do with Leaky Gut and how to manage, heal, and prevent it. We’ve covered everything from IBS to depression, weight gain, Hashimoto’s, and many other health issues. If you’ve missed any of the series, you can read all the articles here. In this article, as I wrap up this blog series, I want to list and explain some of the key supplements, nutrients, and herbs* that I most frequently recommend when treating patients with Leaky Gut. Before we look at those supplements, I want to offer a few words of advice about using them. First, it’s important to pay attention to your body’s response whenever you take a new supplement. Some people are sensitive to supplements, especially when Leaky Gut is present. Therefore, in these situations it’s better to start off with one ingredient at a time, and if needed, gradually add others one at a time. This allows you time to see whether you might be experiencing a negative reaction or sensitivity to a specific supplement before adding another. The other reason why it’s important to introduce supplements one at a time is that if you take too many new supplements at once, you won’t know which IS working and which is not. It’s just as important to know what works well for you as it is to know what does not. You’ll want to work with your naturopathic doctor to help you know in which order to add in supplements to heal Leaky Gut. For you, the order of starting supplements may be very different than for another person. For example, for a person who has a lot of heartburn or nausea, you might need to start with just licorice (DGL) for a few weeks before adding in other support. Whereas someone who experiences a lot of bloating may need to start with digestive support before moving on to probiotics. What they are and what they do: Pancreatic enzymes help to digest food including protein, carbohydrates, and fats with three main enzymes: protease digests proteins, amylase digests carbohydrates, and lipase digests fats. When food is better digested, it is not able to trigger an inflammatory response, nor to be fermented by bacteria, and so supports a healthy intestinal lining. Stress decreases the production of pancreatic enzymes by your pancreas. Who should try them: Anyone who feels they are not digesting food well, or who feels bloated after eating. If you have Leaky Gut, taking pancreatic enzymes is a good way to prevent food reactions and to support healing. Just be sure to check the other ingredients in the product for anything you may react to. Who should avoid them: There are not many contraindications for pancreatic enzymes, although if you have healthy digestion and Leaky Gut has healed, then you don’t need to take them. Some people worry that taking pancreatic enzymes will inhibit the production of enzymes by your body, but I have not found that to be the case. If you have an inflammatory bowel disease or have had recent intestinal surgery then you may need to avoid them (check with your practitioner). If you have allergies to protease, amylase, or lipase, you should avoid pancreatic enzymes. Alternative options: You can support your body to make pancreatic enzymes by decreasing your stress load, eating in a calm environment and taking time to chew your food, and eating foods that are bitter (arugula, for example). I recommend: Enzyme Support because it contains enzymes that specifically help digest casein and gluten in case you are exposed, and will help digest all other food with protease, lipase, and amylase. Take 1 capsule with meals (during or after eating)—take 2 capsules with larger meals. What it is and what it does: Hydrochloric acid (HCl) is present in the stomach to aid with the digestion of proteins in your food – we know it as stomach acid. Contrary to what you might think, it is quite common to be low in stomach acid, and this can increase Leaky Gut because undigested proteins trigger immune responses which cause damage to the gut lining thus making it leaky. When taken as a supplement, hydrochloric acid increases stomach acid to help you digest the proteins in your food. Who should try it: Anyone who has symptoms of low stomach acid such as: bloating, burping, or who feels they are just not digesting food well. NB: You only want to take hydrochloric acid if you really need to as too much stomach acid is also a big problem and can cause heartburn. Who should avoid it: Anyone who suffers from heartburn, reflux, or stomach pain. Also avoid hydrochloric acid if you have an ulcer or if you experience heartburn after you take it. Alternative options: As mentioned under pancreatic enzymes, taking time to chew and eat your food calmly will enhance your body’s production of a healthy amount of stomach acid. Bitter herbs (such as gentian and chamomile) are also used to support stomach acid production. I recommend: Betaine HCl. Start with 1 capsule with food that contains protein (poultry or meat). You may increase the dose to 2 capsules with food as long as you don’t experience burning after taking it. Don’t take HCl on an empty stomach and don’t open the capsules. Don’t take HCl if you have heartburn, GERD or ulcers. What it is and what it does: Bile support supplements such as bile (from an animals source) or taurine, Vitamin B6 or glycine help with the digestion of fats which is incredibly important for healthy digestion and the absorption of fats needed for healthy cells. There are three treatment options: one is to support your body to make better bile by taking the nutrients your body uses to make bile (taurine, glycine, vitamin B6); take herbs that support bile production (beets, artichokes, dandelion root, and milk thistle); take a supplement containing ox bile. Who should try it: Anyone who feels worse after eating foods that have a high fat content. If you have had your gall bladder removed, bile support is essential. It can also be helpful if you have dysbiosis or SIBO (an imbalance of the bacteria in your digestive tract). Who should avoid it: Anyone who feels unwell (or worse) at all after taking supplements to support fat digestion. Ox bile is not vegetarian, so vegetarians would choose a nutrient and herbal product instead. I recommend: Ox Bile with pancreatin. Start by taking 1 with meals and increase to 2 or 3 if needed. What it is and what it does: Glutamine is an amino acid used as fuel by the cells that line the intestines to keep them healthy. It has been shown to heal Leaky Gut.1 Glutamine levels can be depleted when the body is under prolonged stress leaving you vulnerable to Leaky Gut. Who should avoid it: Anyone who feels anxious or worse in any way after taking glutamine. Alternative Options: You can get glutamine in poultry and meat, as well as in bone broth and cabbage juice. I recommend: Glutamine powder or capsules. Glutamine can also be taken in a combination formula, such my Leaky Gut Support formula, which combines glutamine with herbs we are about to discuss below. Take between 500 mg to 5000 grams of Glutamine per day (in a single dose or split in two doses daily). What it is and what it does: NAGs are known to help heal the “tight junctions” – the spaces between the intestinal cells. When these tight junctions are affected by inflammation they stop being so ‘tight’ allowing food particles to travel through the intestinal lining–this is what is known as Leaky Gut. Who should avoid it: NAG products are usually derived from shellfish so anyone who is vegetarian or allergic to shellfish should not try them. I recommend: NAG in a combination formula such as GI Repair Nutrients. A common dosage range is 100 to 1000 mg per day. What it is and what it does: Sulfur molecules, such as those in MSM, help create healthy “tight junctions” between the intestinal cells. Who should avoid it: If you have an allergy to sulfur-containing substances, you should avoid MSM. Additionally, anyone who tends to react to products containing sulfur should start with a low dose and observe for any negative response when taking MSM. Of course stop taking any product if you notice a negative response to it. I recommend: MSM in a combination formula such as GI Revive and GI Response. A common dosage is 100 to 250 mg per day. Who should avoid it: Anyone with elevated zinc levels in blood tests. I recommend: Zinc carnosine by itself or in a combination formula such as Optimal GI powder. A common dosage is 75 mg per day. Who should avoid it: Anyone following a FODMOP diet or who responds negatively to starchy fruits/vegetables. I recommend: Aloe as an aqueous extract in a combination product such as Leaky Gut Support. Who should avoid them: Anyone following a FODMOP diet or who responds negatively to starchy fruits/vegetables. I recommend: Slippery elm by itself, in a tea, or in combination product like GI Encap. What it is and what it does: Licorice is a demulcent herb like slippery elm, and so is anti-inflammatory and healing to the intestinal lining. It is also known to be healing to the esophagus and stomach, so can help heal your digestion from top to bottom. It is often used in the DGL form to avoid affecting blood pressure levels. Who should avoid them: Anyone following a FODMOP diet or who responds negatively to starchy fruits/vegetables. Avoid regular licorice if you have high blood pressure (take DGL instead). I recommend: DGL as a powder or in a combination product like GI Encap or Leaky Gut Support. A common dosage is 500 mg of the extract one to three times per day. What it is and what it does: Turmeric or curcumin is an anti-inflammatory herb that helps heal the intestinal lining by decreasing inflammation (cytokines). Who should avoid it: If you have an inflammatory bowel disease, check with your practitioner before taking curcumin. It is also important to check with your practitioner if you have a tendency to kidney stones or if you need to decrease consumption of oxalates. I recommend: For digestive purposes, a powder or capsule form can be used at a dose of 250 to 500 mg per day, such as in a combination product. What it is and what it does: Cat’s Claw is a healing herb that has been shown to help heal a leaky intestinal lining. Who should avoid it: If you have an autoimmune condition, high blood pressure, or if you are taking medications that thin your blood, then you should check with your practitioner prior to taking Cat’s Claw. I recommend: Protectagen 11 capsules or in a combination product like Optimal GI. Who should avoid it: Negative responses and interactions are uncommon, but if you feel worse at all after taking quercetin, you should stop taking it. I recommend: Quercetin by itself or in a combination such as Optimal GI. What it is and what it does: Colostrum is made from cow or goat milk and supports the healing of the digestive system as well as other areas of the body. Who should avoid it: Anyone who has a severe reaction to casein should speak with the manufacturer and your practitioner before trying it. I recommend: Sovereign Labs because it is liposomal and so better absorbed, and less likely to trigger a casein (milk protein) reaction. What they are and what they do: Probiotics help repopulate your large intestines with good bacteria with the hope that they will stabilize the balance of bacteria, promoting the growth of helpful bacteria and preventing the growth of abnormal bacteria, yeast and parasites. Who should avoid them: Anyone who reacts negatively after taking probiotics should start by healing their digestion before taking probiotics. Anyone who has histamine-type reactions (hives, itchy skin, swelling) should consider avoiding certain forms of lactobacillus that can trigger histamine. If you have Small Intestinal Bacterial Overgrowth (SIBO) be sure to check with your practitioner about which probiotic would be most appropriate for you at this point in time. I recommend: Probiotic Support is a good place to start when addressing Leaky Gut. What they are and what they do: Prebiotics provide food for the bacteria living in your gut, helping them flourish. Probiotics are often made of a form of carbohydrate or fiber such as fructo-oligosaccharides (FOS), larch arabinogalactans, or inulin. Who should avoid them: People who react negatively to probiotics, fiber and/or FODMAPs. You may need to start by healing your digestion and perhaps taking probiotics prior to adding in prebiotics. I recommend: Galactomune and/or 400 to 800 mg of Arabinogalactans alone or in a combination. Wow, that’s a lot of information! Please don’t try to take it all in at once, especially if you have severe Leaky Gut. It is better to start with one product from each of the three categories above and then move on to additional ingredients as you feel your body is ready. Paradoxically, it is with less severe Leaky Gut that your body will be able to respond well to more support. My hope is that you’ll use this as a reference to check back with along your path of healing Leaky Gut. And, because we are all susceptible to Leaky Gut all the time, it is really a guide to supplements that you may want to use in varying amounts at various times of your life. I encourage you to always choose high quality supplements. It is simply not worth taking a supplement from a company that is not holding themselves to high standards of testing and review. And you definitely don’t want supplements to have a long list of unnecessary “other ingredients” that may even aggravate Leaky Gut, such as sugar, sorbitol, and/or gums and waxes. You can find what I consider to be top quality supplements at DrDoniStore.com and receive free shipping with orders over $99. I’d also like to emphasize that diet change and stress reduction is always the first step; supplements can speed up the process, but without lifestyle changes they won’t be a “magic bullet” for you. You can do a test at home for food sensitivities with this Home Test Kit to discover which foods to eliminate. This will also give you a sense of the severity of Leaky Gut. 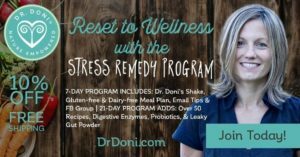 You may also want to consider following my guided program, the Stress Remedy Program, to assist with exactly this situation—healing Leaky Gut. You can learn more about the Stress Remedy Program here. Contact me if you are interested in my comprehensive treatment program, so I can help you with diet changes as well as with supplements that make sense specifically for your case. If you’d like to find out whether you have Leaky Gut and have my help with healing it, you may want to check out my Leaky Gut Solutions Package. It includes consultations, the food sensitivity panel that I mentioned above, and support for implementing dietary changes and integrating supplements to help heal leaky gut. And to receive my next blog post right to your email box, be sure to sign up for my Weekly Wellness Wisdom e-newsletter here. That wraps up the Leaky Gut Blog Series—hope you enjoyed it! Even more importantly, I hope that it has helped you make progress in identifying Leaky Gut and taking steps to address it. You deserve to feel good! Bertrand J1, Ghouzali I1, Guérin C1, Bôle-Feysot C1, Gouteux M1, Déchelotte P2, Ducrotté P3, Coëffier M4. Glutamine Restores Tight Junction Protein Claudin-1 Expression in Colonic Mucosa of Patients With Diarrhea-Predominant Irritable Bowel Syndrome. JPEN J Parenter Enteral Nutr. 2015 May 13. Mahmood A1, FitzGerald AJ, Marchbank T, Ntatsaki E, Murray D, Ghosh S, Playford RJ. Zinc carnosine, a health food supplement that stabilises small bowel integrity and stimulates gut repair processes. Gut. 2007 Feb;56(2):168-75. Hamman JH1. Composition and applications of Aloe vera leaf gel. Molecules. 2008 Aug 8;13(8):1599-616. Suzuki T1, Hara H. Quercetin enhances intestinal barrier function through the assembly of zonula occludens-2, occludin, and claudin-1 and the expression of claudin-4 in Caco-2 cells. J Nutr. 2009 May;139(5):965-74. My wife has GI issues including constipation and bloating and doesn’t digest vegetables well. She tried up to 13 HCL capsules at a time and didn’t feel the burning one is supposed to feel when they hit the level of HCL that works for them – and it didn’t help her digestion. She stopped taking HCL because the amount was scary and not beneficial. Any idea what she can do about low stomach acid and constipation given this scenario? FYI – she’s tried probiotics, bone broth, and glutamine on and off but never saw benefits either. Hi Steve, it sounds to me like we need more information about her digestion. A specialized stool test would tell us what type of digestive support she is needing. And food sensitivity panel would help us know whether there is something she is eating that is contributing. She may also need to do a SIBO test. Read more about testing here: http://bit.ly/testing-for-leaky-gut, and please reach out if you would like to set up an appointment.